GI Blues got off to an early start. 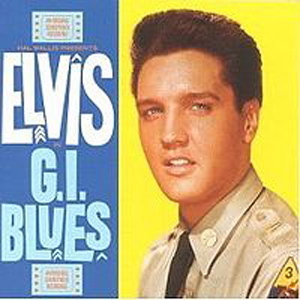 “Paramount is staking $2,000,000 on a bet that Elvis Presley will be more popular than ever following the end of his military stint next March when he resumes picture-making.” So stated Hazel Guild about GI Blues in her Variety article of September 2, 1959. Guild had interviewed producer Hal Wallis, who was already in Germany shooting locale shots for Presley’s next movie, even though the film’s star still had six more months of army service ahead of him. 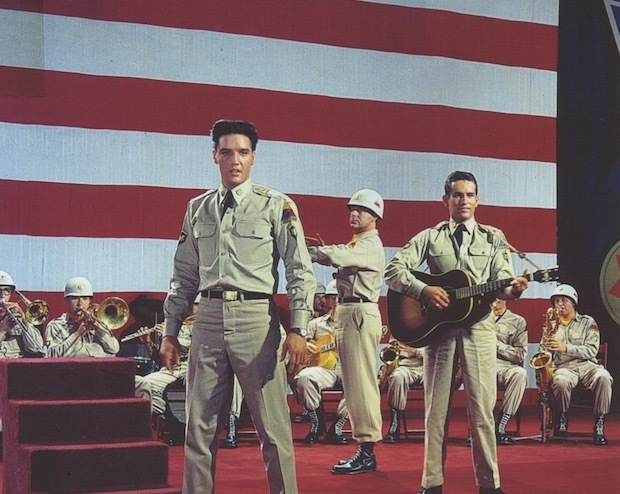 While in Germany, Wallis received complete cooperation from the army, who allowed the director to film tanks and heavy equipment from the Third Armored Division, Elvis’s outfit. An acknowledgement of the army’s cooperation appeared prominently in the opening credits of the finished movie. Also, in a very unusual move, Paramount allowed military camp theaters to begin showing GI Blues on October 23, 1960, a full month before the film was released nationally in commercial theaters. (Variety, 11/9/60). Crowther spent a good part of his review comparing the new screen Presley with the one of two years before. 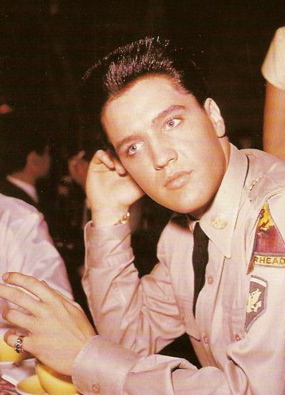 “Honest, you’d hardly know Elvis—the pre-Army Elvis, that is—in the sweet-natured, morally straight young soldier now to be seen on the Victoria’s screen. Gone is that rock ’n’ roll wriggle, that ludicrously lecherous leer, that precocious country-bumpkin swagger, that unruly mop of oily hair. Almost gone are those droopy eyelids and that hillbilly manner of speech. Elvis has become sophisticated. He’s a man of the world—almost. Nearly 50 years after those reviews were written, I sat down to watch GI Blues once again. When I was a young Elvis fan in the 1960s, I enjoyed this film, as I can honestly say I enjoyed most Elvis movies back then. 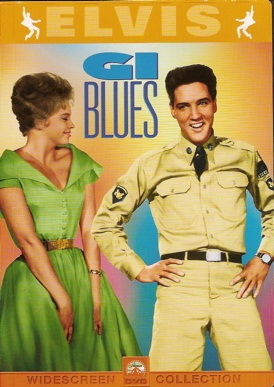 Now, though, I was viewing it for the first time in at least 10 years, and, as I did so, I sought to assess the roll of GI Blues in the developing film career of Elvis Presley. 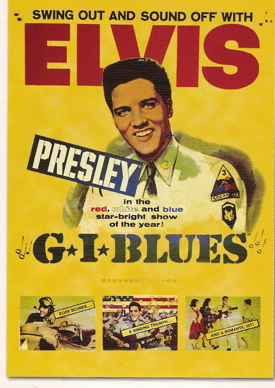 As Presley’s fifth movie, GI Blues had both similarities and differences with Elvis’s previous film, King Creole. Hal Wallis and Colonel Parker both learned from the 1958 movie that having Elvis sing often on screen made good business sense. Wallis learned that it brought Presley’s core fans into the theaters in droves. Parker learned a full soundtrack album could sell as well, if not better, than a standard studio LP. The strategy validated itself when it was reprised in GI Blues. The film fared well at the box office, and the soundtrack album of 11 songs had a long run near the top of the LP charts. Since GI Blues is so unpretentious in its plotting, its worth as a film depends solely on its entertainment value. Does it have elements that please viewers and leave them happy and satisfied? Let’s start with the star himself. Elvis certainly looks good in this film. He obviously had physically matured during his two years in the army. Gone for good is the greasy pompadour (although, as a military veteran, I can testify that no soldier would ever have been allowed to have as much hair on the top of his head as Elvis had in GI Blues). I liked how Elvis smiled often during his musical work in the movie. His pelvic contortions of the fifties were replaced with less energetic twisting hips, shaking shoulders, and facial contortions. (Somehow the gyrations of his earlier years would have seemed out of place in GI Blues.) Just on appearance, then, Elvis fills the bill, despite being given no real acting to do. As for the music, which both the Variety and Times reviewers panned, I felt it was overall pleasing and varied. To be sure, Elvis’s musical numbers do lack the excitement seen in his previous movies. (“Presley sings them all as a slightly subdued pelvis,” observed Variety.) Still, Elvis’s voice was strong and clear, and impressive soundtrack LP sales indicate the songs were pleasing to many filmgoers. The female lead, as often happened in Presley’s career, received better reviews in the film than did Elvis. Variety noted, “Miss Prowse is a firstrate dancer and has a pixie charm reminiscent of Leslie Caron. She deserves better roles than this.” I have to admit that during my recent viewing I was more taken with her work in GI Blues than I had been in previous viewings years before. It’s difficult to take your eyes off of her legs during her two dance numbers, and she makes a believable transition from ice-hearted to vulnerable woman in the film. I found Tulsa and Lili’s day out together, during which their affection for each other builds, to be the most pleasant segment in the film. In terms of on-screen chemistry in Elvis films, I would rate the Presley-Prowse match second only to Elvis and Ann-Margret. 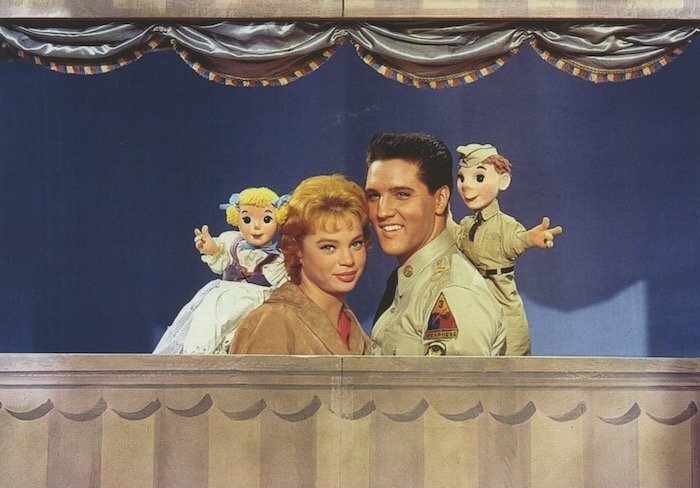 "As the story rested simply on whether or not Elvis’s character could spend the night with Juliet Prowse’s character, the plot offered none of the emotional suspense that Presley’s previous films at least attempted to develop."